For the investigation of the complex inner structure of historic buildings, the application of radar has been increased during the last ten years. Although historic masonry in general is very inhomogeneous and although in some cases high absorption occurs due to enhanced moisture, radar has been successfully applied to get information on geometry, position of inclusions and about kind and size of existing damages. In this paper case studies will be presented concerning the localisation of metallic inclusions and the investigations of the structure of an exterior wall with a multiple leaf structure. For preservation, restoration and change of use of historic buildings usually frequent questions arise on the inner structure. In general, this structure is very complex (Ref 1, Ref 2, Ref 3). Information is required on geometry (size, multiple leaf, voids, thickness), position of inclusions (anchors, dowels, wooden and metallic bars, pipes) and about kind and size of existing damages. These damages must be classified related to their exposure (load capacity, strength) and their severity code. Non-destructive techniques can be powerful tools for amending the traditional methods like deformation measurements, archival analysis, analysis of restoration, archaeological investigation, endoscopy and core extraction. For the development of methodologies for the assessment of historic structures based on non-destructive (NDT) and minor-destructive (MDT) methods and for the integration of different methods and data reconstruction tools, an European project has been initiated. This project titled On-site investigation techniques for the structural evaluation of historic masonry buildings (ONSITEFORMASONRY, EVK4-CT-2001-00060, www.onsiteformasonry.bam.de) comprises four main technologies: First an effective combination of NDT, MDT and some destructive methods for performing investigations from more sides adapted to the problem of the historic structure, second a positioning system for sensor adjustment and efficient data coverage, third software packages for fast and automated data analysis and reconstruction and fourth development and modification of structural models for evaluation of the load carrying capacity of the masonry. For more information on this project, see the contribution of Ch. Maierhofer, A. Ziebolz and Ch. 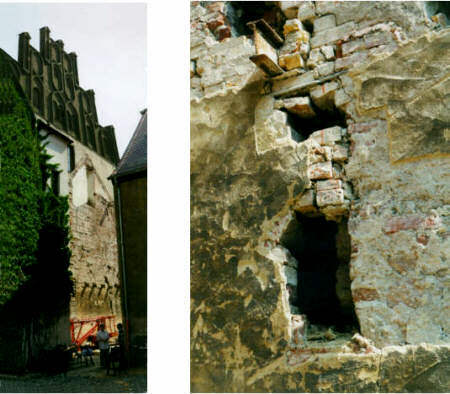 Köpp titled ONSITEFORMASONRY - A European Research Project: On-site investigation techniques for the structural evaluation of historic masonry buildings in these proceedings. But there are still only very few case studies showing the advantages and limits of radar application to historic brickwork for convincing users about the technology. For the radar investigations, the GSSI SIR 10 A system was used together with the 500 MHz, 900 MHz and 1.5 GHz antennas. This method is based on the propagation of short electromagnetic impulses which are transmitted into the building material using a dipole antenna. The impulses are reflected at interfaces between materials with different dielectric properties, i. e. at the surface and backside of walls, at detachments, voids, metallic inclusions etc. When the transmitting and receiving antennas, which are often contained in the same housing, are moved laterally over the surface of the object under investigation, radargrams (colour or grey scale intensity charts over position of the antenna and impulse travel time) are generated. For suppressing or enhancing the reflection from metallic bars, e. g. metallic anchors or columns, the polarisation of the radiated electromagnetic field must be considered. The plane of polarisation of an electromagnetic wave is defined by the direction in which the electric field vector is aligned during the passage of the wave. Usually, the polarisation of an antenna remains relatively constant throughout the main lobe. For the antennas used here, the polarisation is mostly linear, which means that the electric field vector at all times lies along a fixed line. If the electric field vector is parallel to a metallic bar, the cross section and thus the intensity of the reflection is much higher than if the electric field is perpendicular to the bar. In previous works, this effect has never been considered. But performing radar measurements in different polarisation is very efficient for investigating the orientation of metallic bars and for data interpretation in general. For more information on this technique see (Ref 4). For restoration and change of utilisation of the House of Martin Luther in Wittenberg (Ref 12), the ceiling of the large auditorium (see figure 1 left) has to be assessed related to the bearing capacity. This ceiling was built by Friedrich August Stüler in 1846. Therefore, first the bearing system has to be evaluated and thus the hidden construction of the pilasters (see figure 1 right) has to be analysed. In particular, it has to be investigated weather the pilasters include metallic beams or rails and if these have been integrated into the wall. For this application the radar system has been used together with the 900 MHz and 1.5 GHz antennas. It was required to gather information on the construction up to a depth of 70 cm. At each of the eight pilasters, four horizontal radar traces have been recorded at different heights (2.57 m, 1.5 m, 0.44 m an directly above the floor). 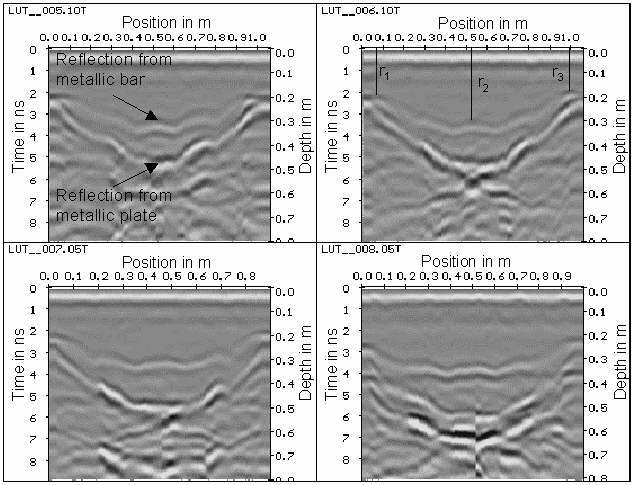 The antennas have been manually moved along the surface of the pilasters including the connected wall region (up to 30 cm on each side, as seen as red line in figure 1 right). These edges of the pilasters have been marked in the respective radargrams. The traces have been recorded with the 1.5 GHz antenna with a time interval of 10 ns of each A-scan. Fig 1: Left: Luther House, large auditorium with the ceiling constructed by Stüler and supported by the eight pilasters. Right: One of the pilasters at the inner wall with a radar trace. Fig 2: Radargrams recorded at one pilaster with the 1.5 GHz antenna at four different heights (top left: 2.57 m; top right: 1.5 m; bottom left: 0.44 m; bottom right: 0.1 m). Fig 3: Left: Cross section of the pilasters. Right: 3D animation showing the inner construction including the metallic beam with the profile of a T-bar. Additionally, four radargrams have been recorded from the backside of one of the inner walls where four pilasters are integrated. For these traces, the 900 MHz antenna was used having a higher penetration depth. The height of these traces was 1 and 2 m at the backside of two pilasters. Figure 2 shows four radargrams recorded at different heights of one pilaster. Each radargram shows two reflections which are visible along the whole trace. In the middle of the radargrams, these reflections have a longer transmission time than at the borders. The first reflection at lower depth can be related to the metallic beam inside the construction. Analysing this reflection in detail, it contains five hyperbolic reflections related to the five aspects of the pilaster. The rays r1, r2 and r3 belong to reflections from the two opposite and the front sides as outlined in figures 2 and 3 left. The second reflection can probably be related to the reflection at a metallic plate, which extends along the width of the pilaster and which is positioned inside the wall at a depth of about 5 cm. The radar investigation from the backside of this wall approve this assumption. From the travel time of the reflections from the metallic bar, the position of the metallic bar inside the construction was determined. From all radargrams recorded at one pilaster, the size of the cross section of the beam is 4.2 cm x 12.5 cm with an accuracy of 1 cm assuming that the cross section is rectangular. Behind the pilaster inside the wall, a metallic plate is integrated which might be connected to the metallic bar. The position of the metallic bar and of the plate has been approved by a small destructive investigation done by a restorer at one of the pilasters. It could be seen that the metallic beam has the cross section of a T-profile. Figure 3 shows a 3D animation of the inner construction of the pilaster including the metallic beam as a T-bar. The inner structure of the exterior walls of the western gable of the Luther House in Wittenberg as shown in figure 4 left had to be clarified in the frame of a comprehensive reconstruction of the whole building complex. Few damages at the wall (see figure 4 right) and some cores showed that in some areas the wall consists of two leafs and in other regions the wall is homogeneous. Therefore, radar investigations have been performed with the 900 MHz antenna along 8 vertical and 2 horizontal traces up to a height of 9 m as shown in figure 5. The distance of the vertical traces was 1 m.
Fig 4: Western gable of the Luther House in Wittenberg. 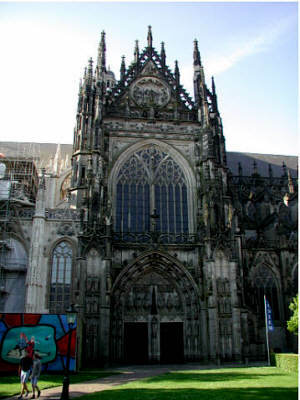 Left: View of the whole gable. Right: Damages at the wall showing the two leaf structure. Fig 6: Radargrams of the traces A (top) and B (bottom) recorded with the 900 MHz antenna. In the top radargram, some reflections at 24 cm can be seen. The horizontal traces have been recorded from north to south. 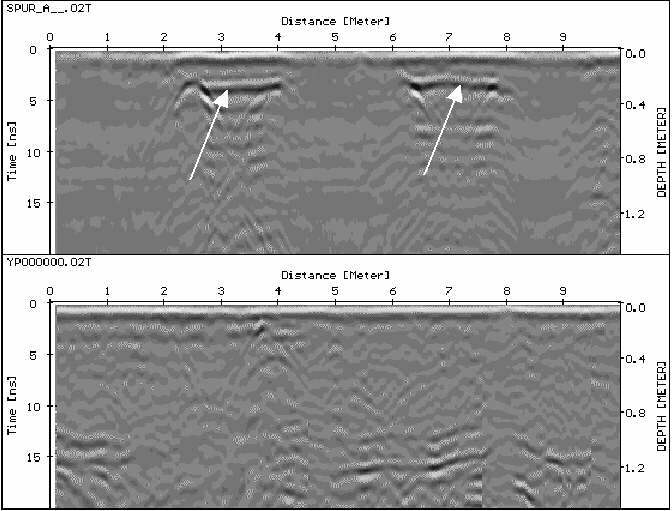 Fig 7: Radargrams of the traces 1 (top) and 2 (bottom) recorded with the 900 MHz antenna. In the top radargram, a reflection from a depth of 45 cm can be seen. The vertical traces have been recorded from bottom to top. Typical radargrams are presented in figures 6 and 7. 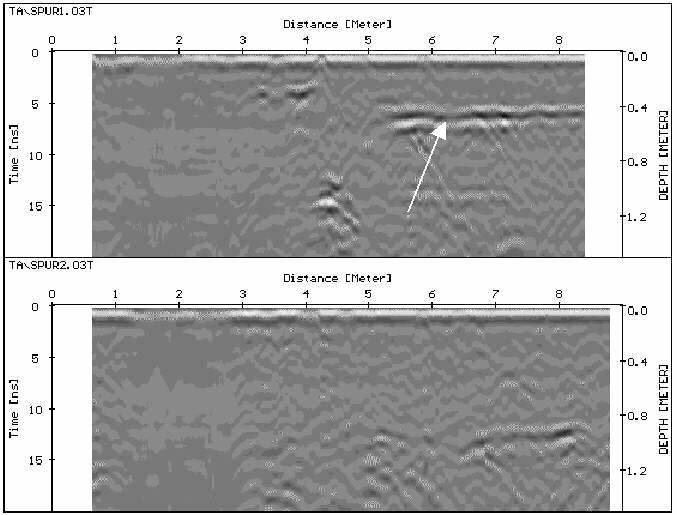 Fig 5: Radar traces recorded at the western gable of the Luther House. The areas where two leafs have been detected are coloured. All values are in m.
In the radargram of trace A (top radargram in figure 6), two reflection bands from distances of 2.5 to 4 m and from 6.3 to 7.8 m can be seen. Assuming a velocity of propagation of 1.5x108 m/s of the electromagnetic waves in masonry, these reflections can be related to a depth of (27±4) cm. Therefore, it is assumed that in this area the wall has a double leaf structure. Openings in this area confirm these results. The two leafs are separated by an air gap. No reflections can be seen in the areas between and no reflections from the backside of the wall can be detected. The radargram of trace B (bottom radargram in figure 6) shows broad reflection bands from a depth of 1 to 1.2 m. This corresponds to the thickness of the whole wall as determined from extracted cores. The radargram gives no hints about the presence of gaps/voids inside the wall. But the structure of the masonry can also be a double leaf one because normally the gap between the two leafs is filled with smaller stones (e.g. broken bricks) and lime. The case of an air gap is irregular: it is the result of the walling up of a former niche. A double leaf structure means the way of construction: two small walls are built up parallel, normally they are connected by some binder stones and the gap is filled with other stones and lime so that a massive thick wall is the result. Reflections from a depth of (47±4) cm can be seen in the radargram of trace 1 (top radargram in figure 7) which was recorded along a vertical trace close to the tower. This area corresponds with the position of a niche countersunk from the inner surface of the exterior wall (which means that the thickness of the wall is only (47±4)cm). In the radargram of trace 2 (bottom radargram in figure 7), some reflections from a depth around 0.9 m appear corresponding to the backside of the wall. Here no double leaf structure and no inner construction can be detected. The results of all radargrams are summarised in colours in figure 5. Reflections marked in red and yellow correspond to two or multiple leaf masonry while reflections from greater depth (green) correspond to the real backside at the position of niches at the inner surface. In the other areas, it can be concluded that the wall is homogeneous, i. e. has no large air gaps. Fig 8: Sand stone facade of the western gable of the cathedral. 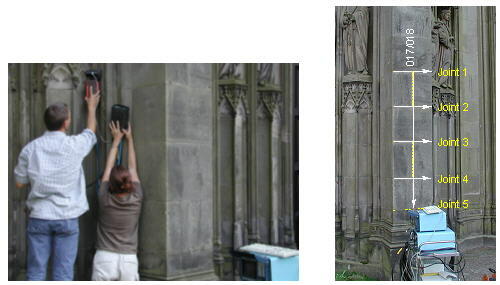 For restoration of the sandstone facade of a gothic cathedral, the metallic elements stabilising and joining the facade to the load carrying brickwork behind have to be detected. This includes the determination of the position of these elements as well as their type (bracket, dowel or anchor). The brackets (steel sheet) are localised in horizontal joints above a vertical joint connecting adjoining sandstone blocks of the facade. They are not penetrating into the carrying structure. Dowels are connecting sandstone blocks which are on top of each other. Therefore, they have a vertical orientation in the middle and perpendicular to a horizontal joint. Anchors are also located in horizontal joints, but they are connecting the facade with the carrying brickwork. Anchors are bended and are integrated into the sandstone blocks of the facade. 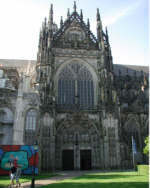 Figure 8 shows the sandstone facade of the west gable of the gothic cathedral. The performance of radar measurements with the 1.5 GHz antenna near to a pillar is demonstrated in figure 9 left. For triggering related to the antenna position, a survey wheel was used. The traces recorded along the surface of this pillar are depicted in figure 9 right. Crossing of joints was marked in the radargrams. All traces are running along the joints to detect the relevant connecting elements. Each trace was recorded in two polarisation configurations. This allowed the selection of the optimum radargram for the investigation of the directed metallic parts which have a size in the magnitude of the wavelength. Fig 9: Left: Radar measurements near a pillar with the 1.5 GHz antenna. Right: Position of joints (yellow) and radar traces (white) at the surface of a pillar. For the determination of the velocity of propagation of the electromagnetic waves in sand stone, the travel time of an impulse reflected from the backside of a sand stone with known thickness was recorded. This results to a velocity of v = 0.17 x 109 m/s which corresponds to a dielectric constant of 3.1. 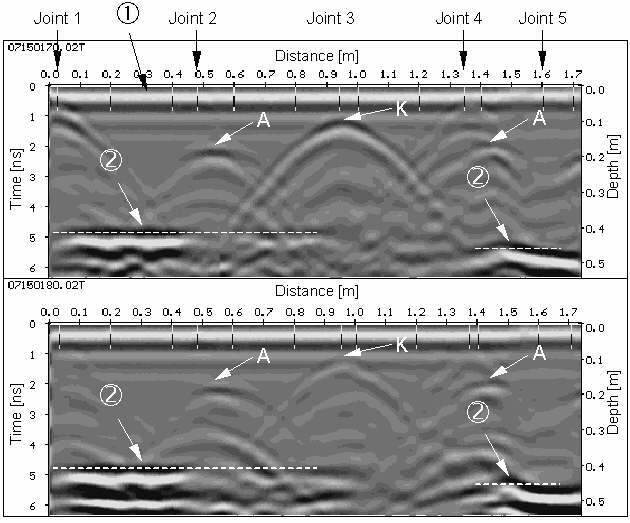 Fig 10: Radargrams of the vertical radar trace 17/18 at the surface of the investigates pillar. Top: horizontal polarisation. Bottom: vertical polarisation. For the position of the trace, see figure 9. Figure 10 shows the radargrams in both polarisation configurations recorded along the trace 17/18. In both radargrams, the reflections from the backside of the sand stones are seen at depth of 41 to 45 cm. At the position of joint 3 at a depth of (10±2) cm a reflection hyperbola (K) is visible which is more intense recorded in horizontal polarisation configuration (electric field is horizontal). Due to the position of the reflector in the middle of a horizontal joint, this reflection can be related to a bracket. Two additional reflections (A) below joint 2 and below joint 4 in a depth of about (18±2) cm can be related to anchors in the joints which penetrate into the sand stone below. Several other areas have been investigated. It was not always possible to interpret all reflections due to the unknown size of the metallic elements and due to partly strong super positioning of reflections from empty or partly filled joints or from surface structures at the facade. Therefore, few areas have to be selected for minor destructive and destructive testing getting more detailed information on the geometry, position and orientation of the metallic elements. Also information on the material properties can be obtained by this procedure. From this study it was concluded that, when conditions are favourable, radar is a very useful tool to get information about the internal section of a historic structure. With a very high reliability the position of metallic inclusions like bars, anchors, brackets and dowels can be detected with an accuracy of about 2 cm. But it has to be considered that only few information is gained about the size and geometry of these inclusions and nothing can be said about the functionality (e.g. about corrosion). The inner structure of masonry walls can be investigated with adequate resolution related to the thickness and the presence of air gaps (two leaf structure) and voids. This works credible for dry masonry. Due to the high absorption of electromagnetic waves in moist and salted brickwork, a high moisture content reduces the information content of the reflected waves drastically. In the future, more on-site investigations are planned in combination with other NDT methods like ultrasound and active thermography. Here, the complementarity of the different methods will be investigated and algorithms for data fusion and clear presentation of results will be applied. The applicability and reliability of tomographic radar measurements will be analysed to get more enhanced resolution for mapping the inner structure of brickwork. Part of this work was funded by the European Commission in the frame of the EESD project ONSITEFORMASONRY (www.onsiteformasonry.bam.de). aniels, D. (1997), "Surface-Penetrating Radar", London: The Institution of Electrical Engineers.